We recently held a webinar in which our Chief Strategy Officer, Steve Griffiths, and Institute for Supply Management’s (ISM) Managing Director of Global Operations, Lane Burkitt, discussed the impact technology is having on maverick spend. One of the points they touched on during their discussion was why maverick spend can be such a problem for procurement organizations – and in what instances it’s not a problem. Want to know more? Watch this clip or read the transcript below – and be sure to check out the full webinar! Let’s talk a little bit more about the problems with having maverick spend in your organization. What are these big problems? LANE: We lose visibility when we have maverick spend. In one example, we didn’t have visibility into what we actually needed for the business or what we were ordering for the business – only what the supplier was able to provide. And that’s not always the same thing. We don’t necessarily see what the business really wants, and depending on the kind of business, that can be a big deal, because we need to make sure that our suppliers are able to provide us with exactly what we’re looking for. Also, there’s a savings opportunity associated with being able to aggregate spend together. When we’re going off-contract or off-policy, then we’re not necessarily bringing our spend together under one supplier so that we can increase our volumes, or our spend, with our preferred suppliers and get a better negotiating position. We lose that. We’re missing all kinds of opportunities to grow with our preferred suppliers when we have too much maverick spend. Related: Why does maverick spend occur? STEVE: When you can see the spend, you have the opportunity to really act on the spend. But oftentimes, corporations don’t see the spend to be able to act on it. There was an example once where one of the large auto company CPOs simply asked their head of indirect, “How much do I buy in lighting?” And the response was, “Maybe $20-30 million.” The CPO then asked the lighting suppliers how much they were buying, and it was a number 4x times that. So, it just goes to show how much opportunity can really be lost if you’re not on top of the spend and tracking where that spend is going. And clearly, this has to be maverick spend because they didn’t even know what they were spending. But every time maverick spend happens, it’s not always a problem. Do you want to talk a little bit about the situations in which it’s not an issue? LANE: One of the reasons that we have the ability to go out and spend off-process, or off-policy, or off-contract is because sometimes it’s required. Sometimes, we need to be able to go and buy something when we need it. If we lock down the operations people so that they are unable to buy from other suppliers or from other sources, then we actually inhibit the business from moving forward and doing what it needs to do. Click To Tweet And so, one of the things that operations folks need is that ability to get what they need when they need it. If there’s a danger of the line going down, or a danger of a product not being delivered to the customer (any kind of product or service), then we need to take care of that problem right now, and sometimes that means maverick buying, by definition. So, it’s not always a problem. Take for instance an example of a supplier who has shipped us a product, but has something happen, whether it was a storm in the Midwest (what was it this year? A polar vortex, right? ), and our product was unable to make it to us in the lead time that we had planned. Well, we need to get something. Maybe we can get it locally, but at a higher price. And so, we go ahead and order it, bring it in so that we can continue producing product. That’s not the wrong thing to do for the business, even though it is maverick buying. STEVE: That is absolutely true. Companies often put in place the p-cards for the local plants to be able to respond to their emergencies. But when they’re doing that, it’s also important to put the right kinds of controls around those p-cards because what is intended as something to get the plant flexibility for emergencies can migrate into certain abuses. We were recently working with a company where, as we were looking at their spend, all of a sudden we noticed there was $8 million of temp labor charged to the p-card for some reason. I just don’t think that was what anybody intended that p-card to be used for. 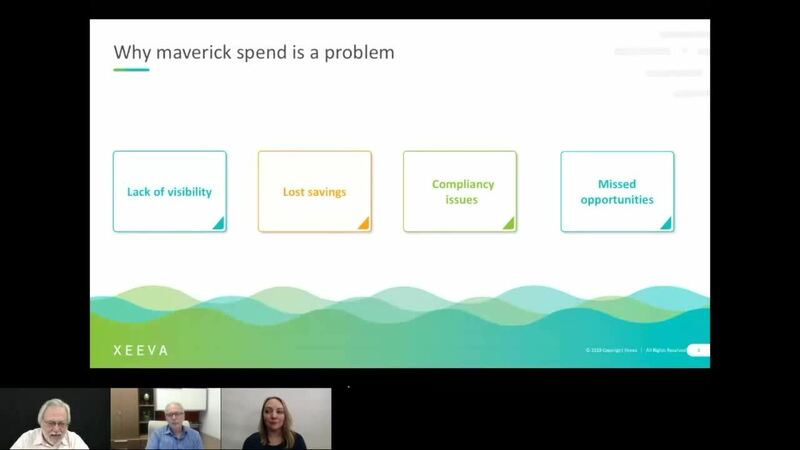 Learn more about maverick spend and how it can be eliminated with advanced technology by watching the full webinar! Laura’s sense of humor and creative mind drive the voice for Xeeva’s written content. In between writing and brainstorming new ideas, she enjoys reading, playing with her dog, and testing out new cocktail recipes (while her husband does the cooking). How can technology eliminate maverick spend?